While high doses of X-rays and other types of high-energy electromagnetic radiation are known carcinogens (cancer-causing agents), most studies haven’t found a connection between exposure to low levels of radiation – such as those used in dental X-rays and mammograms – and increased cancer risk. Most of the evidence linking high levels of radiation exposure to cancer comes from studies of specific groups of people, such as those who survived atom bomb blasts in Japan during World War II, survivors of the Chernobyl nuclear accident in the Soviet Union in 1986, and individuals such as uranium miners and nuclear power plant workers whose jobs entail exposure to high amounts of radiation. As a general rule, the risk of cancer rises as the level and duration of exposure rise. X-rays and higher-energy forms of radiation known as gamma rays exist at very low levels in the natural environment, from sources such as radon gas, the breakdown of radioactive elements in the earth, and cosmic rays from the sun. X-rays are also used in a variety of technologies such as cancer treatment and, at much lower levels, in medical and dental imaging, food irradiation, and airport screenings. X-rays can damage living cells by producing mutations or other changes in the DNA within the cell nucleus. In some cases, the changes are so debilitating that they cause the cell to die. In others, they disrupt the orderly process of cell division. Over time – generally, many years – genetic changes can accumulate to the point where the normal controls on cell division fall away and the cell becomes cancerous. The amount of radiation used in diagnostic tests varies from procedure to procedure. A standard, two-view chest X ray delivers about .1 mSv (millisieverts, a measure of how much energy reaches a specific part of the body), compared to 7 or 8 mSv for a regular CT chest scan, according to the American Cancer Society. Fluoroscopy, which uses X-rays to make moving images of internal body structures, exposes patients to different amounts of radiation depending on the duration of the test. 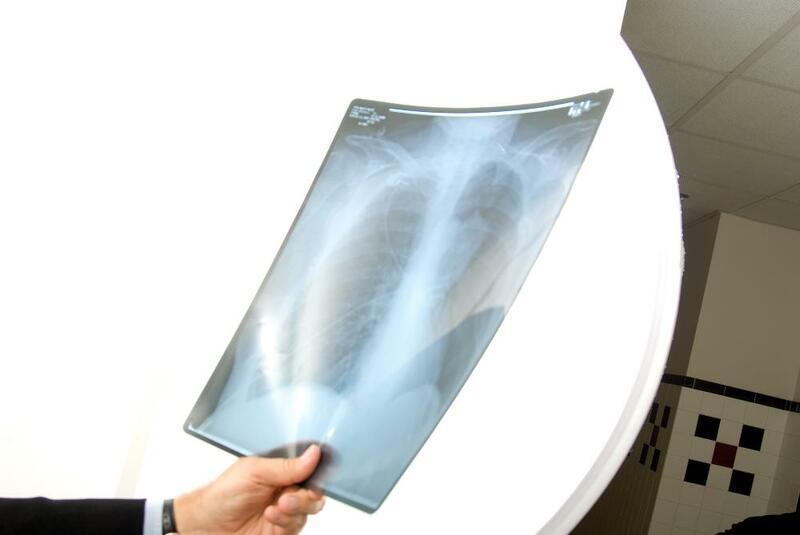 As a treatment for cancer and other diseases, X-rays and other forms of radiation have a long history, stretching back to the early 20th century, when German and French researchers discovered that X-rays could in some cases shrink or obliterate tumors. Not long afterward, however, it was found that exposure to X-rays, particularly at high doses for an extended period of time, could also cause cancer. Over the past 100 years the safety of radiation therapy has improved markedly as technologists have devised ways of aiming radiation beams with extreme precision, delivering high doses directly to a tumor while minimizing the amount reaching surrounding tissue. If cancer does occur as a result of radiation therapy, it takes years to develop. Radiation therapy-related leukemias, for example, generally appear five to nine years after exposure. Most other radiation therapy-related cancers take even longer – 10 or 15 years, in some cases. Children are much more sensitive to radiation – and more prone to develop long-term health problems as a result of radiation therapy – than adults, and therefore are prescribed lower doses of radiation-based treatments. Keep track of your X-ray history. When prescribed a radiation-based diagnostic test, such as a CT scan or nuclear medicine scan, ask your physician whether a test involving lower or no radiation is feasible. Consider less-frequent testing. If you’re receiving CT or other scans for chronic conditions, ask your physician about increasing the time between scans or using a lower-dose imaging technology. I have a back condition that required spinal X-rays once a year during my preteen/teen years. I don’t remember for how many years, but eventually the follow-ups were ended and one of the reasons was the risk of getting too much radiation. Five years ago when I was 25, I was diagnosed with gradus IV brain tumor, medulloblastoma. I have been wondering ever since if the reason behind my cancer could be the exposure to radiation when I was young.. This has also made me mad at times, thinking if this could have been prevented?? I have had 32 mammograms over my lifetime. I am now 62. All this because the American Cancer society recommenced a mammogram yearly because I had 2 aunts that were diagnosed with breast cancer. One aunt was diagnosed in the 1960’s but did not die of breast cancer the other aunt had an emergency mastectomy in the mid 70’s and lived another 12 years without chemo during that 12 year period. I have Metastatic adenocarcinoma of lung (EGFR L861Q mutation). I was diagnosed 11/2017. I live a pretty healthy life style, non smoker and I always wondered if all that mammography contributed to the cancer. I think many of us diagnosed with cancer(s) despite participating in a healthy lifestyle look for some unknown reason, some catalyst that might have been the straw that broke the camel’s back causing us to get dreaded cancer. I have been living with cancers since 2005 and readily accept that I’m merely a statistical blip on the radar. It’s not anyone’s fault, it’s not because I smoked cigarettes rarely in my twenties, or worked as a chemical assistant during my fertile years, or as an oncology nurse prior to my diagnoses. I’m just a number in the big picture living with a complicated medical story of complex diagnoses. To a curious physician, I am novel, to a burned out one, I’m difficult. For myself, I am my own best advocate. No one knows my body and its nuances better than me. I own my disease, do my homework, and advise my professional caretakers as much as I receive advice. We inevitably arrive at a mutual decision on how to proceed and the upside: I’m still alive living a well-balanced life continuing to advocate, engage and learn.